Note: All photos courtesy of Andrea D’Silva. Our previous event, Night at the Speakeasy, was set in the 1920s, and a number of people came dressed up in amazing costumes. 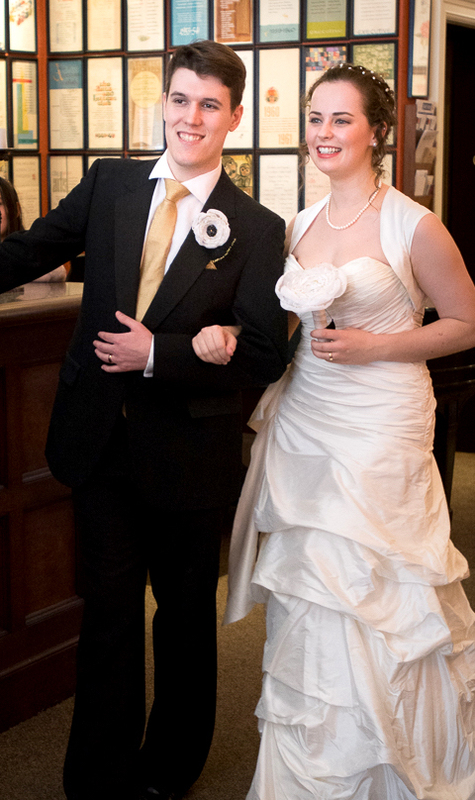 We wanted people to dress up for this one as well, so we decided on a wedding theme. 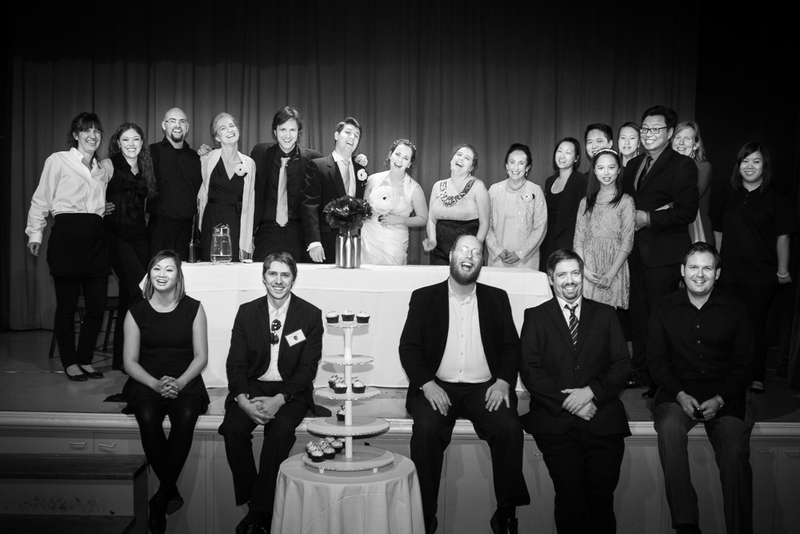 We also had Ruby, an actual Wedding Event planner, which solidified our choice! There were three sessions again, meaning I needed to be in the same suit for about ten hours. I had gained some weight since last I wore it. Would the pants hold? I certainly hoped so. I had a different role this time around: I was the MC and started and ended the night. It was exciting for me because I could actually watch how people were interacting! “You have been invited to the wedding of Cassie and Calvin, people you used to work with years ago. You are surprised to hear from Cassie, who seemed to disappear after the company dissolved. She used to work in HR and loved riddles and puzzles, which was the bane of all employees considering the yearly aptitude tests she would conduct. This was held at the Arts & Letters Club, a beautiful, historical building located in the heart of downtown Toronto. Founded in 1908, it is a meeting place for professionals in the Canadian Cultural scene, filled with art and paintings, which may have been too tempting for an escape crowd. I had to tell them ahead of time they weren’t allowed to touch a lot of the displays. It was a great venue with a perfect layout: we had the main hall which held a stage, the bar area, the downstairs, and a private room. For the staff, we had dressings rooms, and access to the balcony. There were nine actors for this event and the players needed to question and talk to these actors throughout the night. However, there were also sixteen other people with pivotal roles, giving us a total of twenty-five people doing their best to make the evening awesome. All of them will be listed at the end of this article to give you an idea of how many people were required to put this together! Back in January of 2016, we decided on our theme, giving us about three months. This time around, we had a certain number of goals. Player interrogating the Mother of the Groom and the Best Man. The speakeasy had a lot of interaction, but only for a few members of the team. This time around, we wanted everyone involved in talking to actors and moving around, so we structured the puzzles to be more interactive. Of course, if a team was filled with introverts, they would have a difficult time since the puzzles involved doing activities one would do at a wedding. One of the “puzzles” was to give a toast to the bride and groom. The podium was up on the stage with a microphone, in front of all the guests in the main hall. One team terrified at the thought of speaking to that many people, and it took them awhile to figure out which one of them would be tasked with the ordeal. 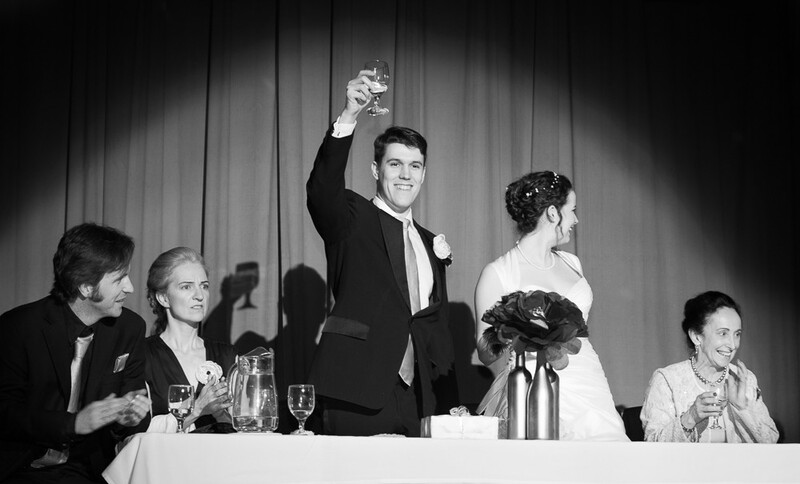 In the end, they didn’t even give the toast because they discovered the answer as they were heading to the podium. There is another activity I won’t reveal here, but it was especially fun for us to watch. In each event we’ve done (of course, there’s only been two), we want an element of interaction specific to the theme and one all the players would find exciting to do. In the Speakeasy, the players needed do something specific in a blackjack game. However, this was at the end of the game and not a lot of teams had the chance to do that. This time around, we put the “cool interactive part” at the start of the second act, so every team was able to participate. 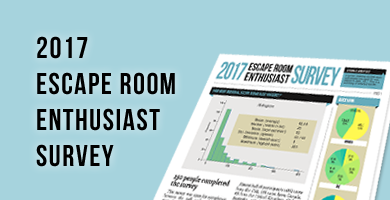 The Speakeasy had around a 25% success rate, which is normal for an Escape Room. We wanted more people to win at Night of the Wedding. The game was separated into two acts. The first act had a starter puzzle and the main set of puzzles for the wedding. This took about forty-five minutes to solve. The second act had a smaller set of puzzles and took around ten minutes to solve. There was also a smaller side plot introduced in the first act to set the stage for the second act. The show lasted sixty minutes, the clock starting when I gave my opening speech. We wanted all the teams to make it to the end puzzle. The final puzzle was a choice presented to the players. It allowed for two different endings for the plot. Although not too many people made the correct choice, we wanted to make sure every team had a chance to choose an ending. So we made the puzzles easier. There were some puzzles which were nothing more than simple observation, and for the more difficult puzzles, we put in clues outlining what needed to be done. From our beta tests, people found the puzzles easier than the Speakeasy. However, we decided to stick with “Aha!” puzzles as opposed to “Process” Puzzles. Process puzzles are puzzles which could, for the most part, be solved by a computer: cryptograms, sudokus, algebra, etc. These puzzles could be solved quicker by working harder. “Aha!” puzzles usually require a flash of inspiration to see what the solution is. Once you get it, it’s solved and you can move on. However, ‘getting it’ is the trick and could stump you for a long time. We tried to make simple “Aha!” puzzles, but it was still challenging for a number of people. But it wasn’t the puzzles that slowed people down. The next set of puzzles, the main set, was collected from the actors. The only restriction in getting these puzzles was finding the actors, so teams eventually had a table filled with cryptic papers. 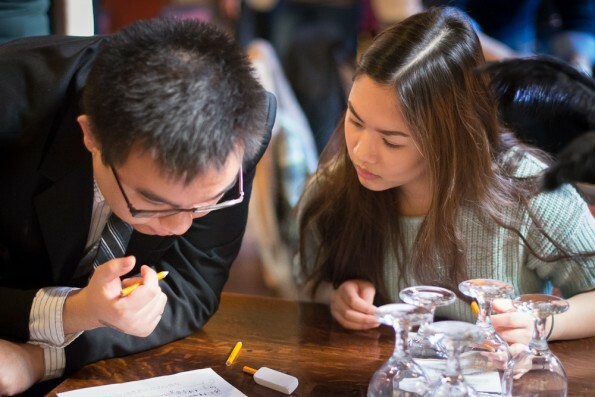 Many teams were overwhelmed by the glut of information. Although the puzzles themselves were easier, communication and organization were key in getting them solved. It would take a strong team to finish the night early. Despite that, most teams caught on and in the end, almost 90% of the teams made it all the way through to the final puzzle. Huzzah! We spent three months working on plot and puzzles. We had a story outline, but we needed to present it to the players without creating any type of bottleneck. We did not want any team complaining they did not finish the game because they had to wait for an actor to advance the plot. So ideas came in, and ideas were cut. We originally had four potential bottlenecks, and we cut it down to two. We also wanted to make setup and admin easier for the volunteers, so there were other immersive ideas we wanted which were eventually cut. In the writing world, one needs to ‘kill your darlings’. The phrase has taken on multiple meanings, but in our case, we needed to remove bottlenecks no matter how cool they sounded. There was one scene that involved a dagger. We cut that scene, but Ruby had already ordered the prop, so now we have a fake dagger. (Sorry, Ruby). We also had an idea to have the players escape through the backstage down through the basement. But we would have needed more volunteers, more time, and permission. We wanted to make that work, but it would have been a huge bottleneck if implemented. In the end, we were pleased by the flow of the night. From the comments we received, no one noticed any bottlenecks, and that made me extremely happy since it had plagued my thoughts for the last two months. The story was complicated. Manda and I spent a lot of our commute time discussing plots, plotholes, ideas, and why they would and would not work. Manda’s main job was details. We would come up with a character, and she would flesh out a background, characteristics, and how they fit into the story. The story was written out far more than what the players saw. They probably only knew about 20% of it. If they were diligent, however, they may be able to find 50% by talking to characters and asking the right questions. But even then, a lot of it was back story and only there to provide actors with a solid foundation to answer questions. We got a lot of questions that night, and our actors were ready! In the end, 95% of the tickets were sold. That’s pretty awesome, considering we’re a small unknown venture in Toronto. Many participants and teams came in costume as we had encouraged. We saw a few tuxedos and shimmering dresses. These were awesome. Cream icing! As mentioned before, around 90% of the teams made it to the final puzzle. However, not very many people answered it correctly. A lot of people tried to cheat, and thus, I’m not counting their answer as an official success! 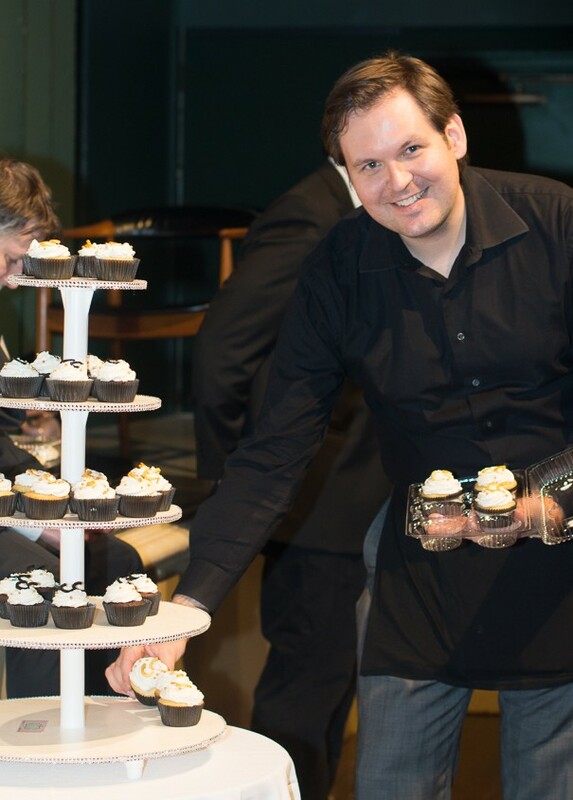 *laugh* They all got cupcakes though, so really, it’s a win for everyone. For the record, I did not anticipate a loss condition. We made arrangements for this on principle, but I fully expected everyone would answer the final puzzle correctly. I was wrong. When the teams were presented with a choice, one actor tried to sway them to the wrong answer. This actor was very successful, and I heard multiple comments from players who felt they should trust this actor, even though there were clues laid out to convince them otherwise. I didn’t expect that. We received a string of positive feedback about interacting with our actors, and I cannot thank these folks enough. Joshua – Back again as our groom, he was the first one to say yes! Always enthusiastic, always willing to bring it to the next level, he will always be part of the CC team! Erin Eldershaw – We wanted Erin for our last event but she was busy. We were so excited she could join us this time around as our bride. She fit the part perfectly and did a great job as the bubbly bride! Barbara – I’ve been involved in many projects with Babs. She’s reliable, passionate, and does a fantastic job! You may also recognize her as one of the actors at Casa Loma’s King of the Bootleggers. Kris – Brand new to our event, Kris was an amazing addition to the cast. We heard some great comments from players who enjoyed talking to her, and she was a perfect mother of the bride. Steph – Also new to Canadian Caper, Steph researched her role like nobody’s business! She was wonderful and played her part exquisitely. Lyf – I love Lyf. He reprised his role as the bartender, but this time I gave him more to do. I knew he was doing a part which I couldn’t see during the night, so I requested him to practice his script in front of me. It was awesome. We needed a lot of people to pull this off, and there was a bit of stress involved when we realized we didn’t have enough people. Fortunately, some friends stepped up to the plate and we were good to go! Annie – We did not have a person to be at the coat check, and we needed someone there. The alternative was to man it myself, or send my wife down to do it, but I already had her being the assistant bartender. I was mulling through other possibilities through my head until Ruby told me she found Annie to take over. It was a huge relief to hear. She did awesome, and stayed in her role, all by herself in the basement, when she realized people still needed her for a puzzle. She was a huge help! Carole Robotham – We pulled in a friend of mine who used to bake for the British Embassy. She made three hundred cupcakes at her house, and they were amazing! I broke my diet to try one of those. 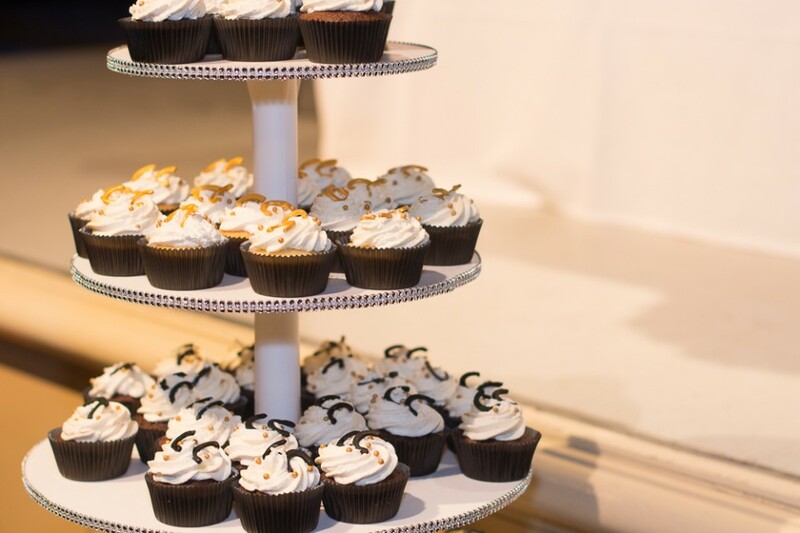 They were decorated with our theme colours of gold and black, and were delicious! 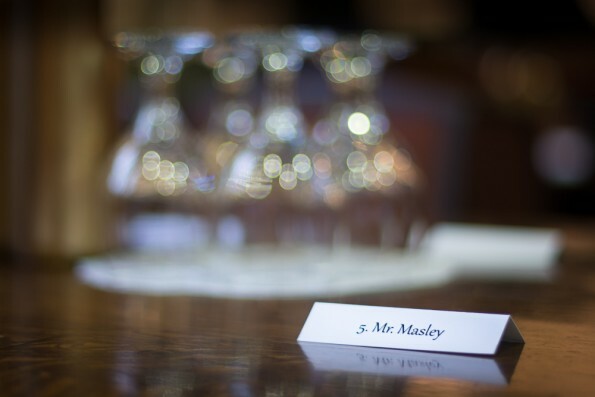 Andrea D’Silva – What wedding doesn’t have a photographer? Not only was she willing to show up for the whole day, she even came to two beta tests to take pictures and help out. Furthermore, we got the pictures the next day! Outstanding service and wonderful photos! Sunny (MUA) – At the last minute, we got a makeup artist, again thanks to Ruby! It was great to have one, and he touched up all the actors with makeup in between sets. It was fascinating to see! Melanie – Melanie is my cousin, and she is always tireless when I drag her into my silly endeavours. She’s totally awesome and we owe her a lot! The Elumir Family – My kids are always involved, but this time, they got roles. In fact, they attended every beta test we had! Of course, Zoe got into the cupcakes, and that was interesting (as seen in this video). My wife has always been supportive and took on a number of roles through the beta tests and then took a the job as the assistant bartender at the last minute. She is amazing. I also got the chance to hit on her as my role as Walter. Hee hee. The Guards – You may have recognized these guys from the Speakeasy and they’re back again. Mark Lindan got a chance to try out a new role, Tom White got a chance to be more vocal, and Dan Charrington was in top form being loud and rude (as we told him to be). We brought in newcomer Kyle Whitney (Manda’s brother) into the fray, and he fit right in. They looked awesome as security guards for the night. Of course, all of this could not have been done without the Canadian Caper Crew: Yuri, Jen, Will, Manda, Mike, Ruby, and myself. We all did an excellent job! The most difficult thing about about being a creative is execution. Having a hundred ideas but not following through is a common lament of the artistic soul. I have done a number of projects in the past, and having a group of people skilled in bringing things to completion is paramount to success and something I will never take for granted. In the end, it was an awesome team, and I’m so excited we could put together an amazing project. This team brought a wedding gift! So, how was it received? We read through all the feedback forms (and all the comments) and calculated the main ranking “How likely would you recommend us?” About 60% of the total surveys were filled in. That’s 98% of people scoring us a 7 or better. For you marketing types, our NPS (Net Promoter Score) for the whole night was 58! Normally, one would need to compare that to the industry, but the range is from -100 to 100, so that’s awesome! “Congrats again on Night at the Wedding! My friends and I had such a blast playing. The few of them who also played Night at the Speakeasy also agreed that you really learned from that one and outdid yourself this past weekend. I was really impressed with the overall design and flow of the game and people in the space and great Aha! moments throughout the puzzles/game. …Your actor interaction is top notch. Thanks so much, Kevin! We are so pumped when people enjoy our games! All of us at Canadian Caper were pleased about the night! Myself, I was so happy to talk to people. Please, feel free to tweet me, or contact me! 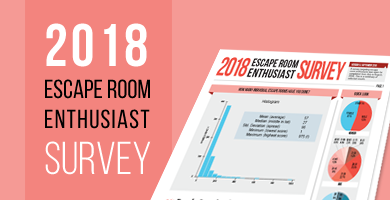 Keep the escape room community going! 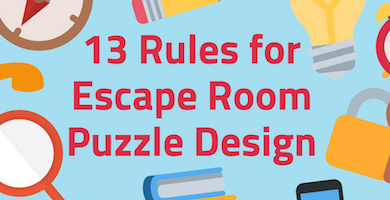 I love talking about escape rooms and puzzles. Oh, and one last thing, I didn’t tell you what happened with my pants. I fell down near the beginning of the night, and my button popped off. I still need to lose more weight. Thank you so much for coming and have great day! Fascinating! How do I get on the mailing list for your next event, please? That should be a button right after this incredible blog post. Oh, wow, that’s a good point!